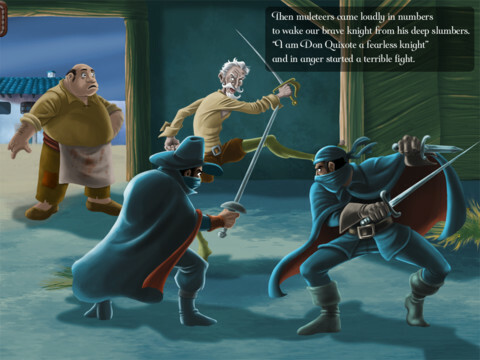 The Adventures of Don Quixote is an interactive book available for download for iPad. This book has been developed by Touch of classic. Experience the classic Adventures of Don Quixote in a completely interactive environment that will thrill your children and yourselves. Interesting thing is that on each page there are some hidden elements, puzzles and challenges that take full advantage of the iPad’s interface. Touch of Classic is recognized for bringing classic literature alive, sparking interest in children and getting them familiar with some of the most famous characters from the literary world. The Adventures of Don Quixote book’s features stunning and highly detailed original artwork, an original musical score that complements each scene and a range of interactive options that are guaranteed to lock your child’s attention. This kind of books are getting more popular in the App Store , and it is clear to see why: the level of interactivity on each page are definitely adds an extra touch to the experience. The Adventures of Don Quixote, for example, certain pages have to dress in armor, in other parts of the touch screen to get a change of scenery, painting sections and so on. As a bonus, we also look for hidden “coins” in some of the panels. The experience, as I said, it is extremely fun, and something that will delight the children at home. Probably even encouraged, later, to read the original novel.